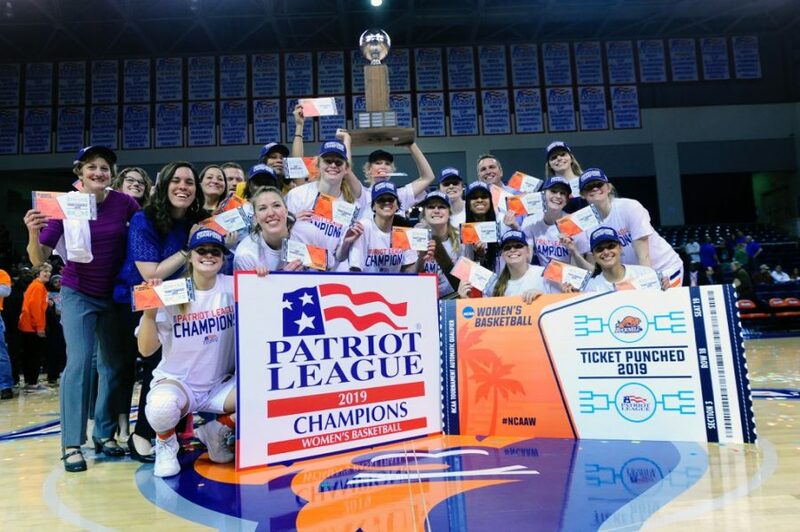 The Bison women’s basketball team will be going dancing as they captured the 2019 Patriot League Championship title with a win against American University on March 17 at Sojka Pavilion. The top-seeded Bison claimed their victory with a 66-54 win against the No. 2 Eagles. The team enters the NCAA tournament for the second time in the last three years and the fourth time in program history. The Bison are 28-5, setting a new program record for the number of wins in a season. This was was the 102nd win for the five seniors on the team. They are the winningest class in Patriot League history. The triple threat of Kaitlyn Slagus ’19, Kyi English ’19, and Kate Walker ’19 led the way. Slagus scored a game-high 23 points, English had 14 points and six assists, while Walker tallied eight points and seven rebounds. Ellie Mack ’20 also contributed double-digits in scoring, finishing with 11 points. Slagus started the game strong with seven points in the Bison’s 12-2 run in the first quarter. She finished 9-for-14 from the field, 2-for-4 from the three-point line, 3-for-4 from the foul line, and added seven rebounds and four blocked shots, earning her Tournament MVP recognition. Just 1:22 minutes into the second quarter, Walker hit a big three-pointer that gave the Orange and Blue a 20-10 lead. With 1:06 minutes left in the first half, the Eagles took their first lead of the game, 24-23. The advantage did not last long, as Mack responded with a short baseline jump shot and assisted an easy layup to Slagus as the halftime buzzer rang. The Bison entered halftime with a 27-24 lead. As the second half took off, English was the first to score, sinking a three-pointer, followed by threes from Abby Kapp ’21 and Mack and a layup from Slagus. The score at the end of the third quarter was 47-41 Bison. 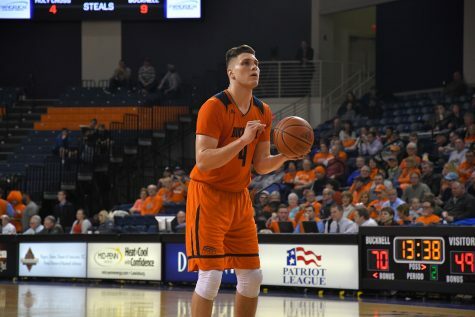 The Eagles came within four points in the fourth quarter, 56-52, before the Orange and Blue answered with a bucket from Kapp and a block from Slagus to stem American’s rally. Offensively, the Bison shot 48.9 percent overall, shooting 7-for-16 from beyond the arc. The Bison held the Eagles to 37.5 percent shooting and finished with seven steals. Mack, Walker, and Slagus were recognized on the All-Tournament Team. After lots of sweat, tears, and preparation, the Bison are ready to make an appearance in the NCAA Tournament against the Florida State University Seminoles on March 22 at 4 p.m. in Charlotte, N.C. The Bison’s last NCAA appearance came in 2017 when they fell to No. 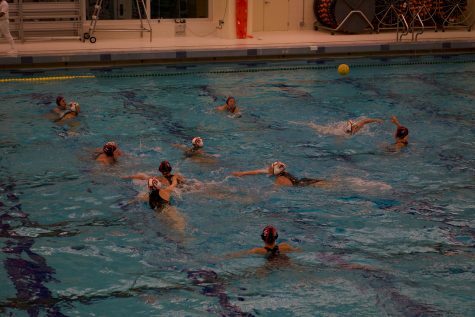 3 Maryland after defeating Navy in overtime in the Patriot League Championship.